The e.l.f. Moisturizing Lipsticks feel like almost a lip balm and lipstick in one. The formula starts off smooth and hydrating (thanks to shea butter and a whole slue of waxes), which my dry lips can really appreciate. The one downside however is that they contain mineral oil, paraffin, and microcrystalline wax (all petroleum byproducts) and propylparaben, which is the main reason I don’t reach for these on a daily basis. As with any moisturizing lipstick, the creamy formula tends to transfer pretty easily onto cups, napkins, etc. I find that even with only light drinking (and no eating), they’ll fade by about 50% after 2 hours of wear. By 4 hours, only a slight stain will remain, at which time, I’ll apply another coat. The e.l.f. Moisturizing Lipsticks vary when it comes to pigmentation. Flirt & Fabulous for example, starts out slightly sheerer than Pink Minx. 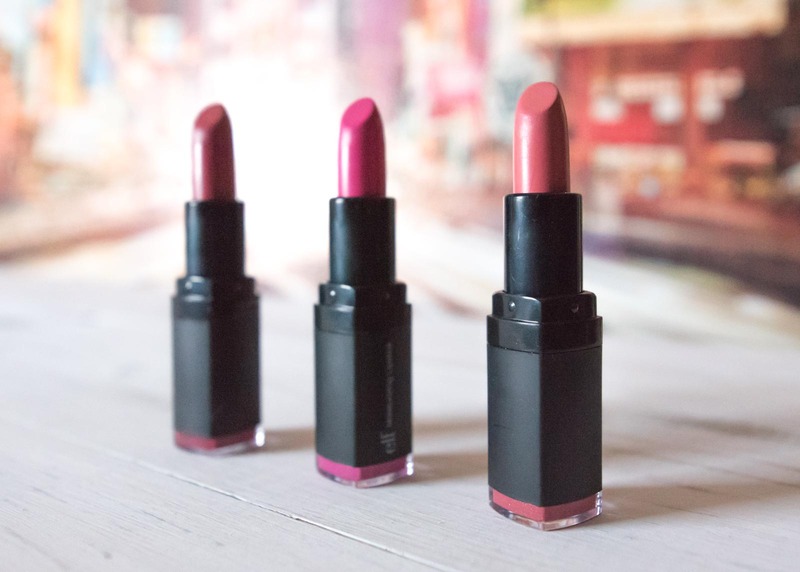 However, once built up (usually after 2 to 3 swipes max), they each provide the same coverage (plus a glossy sheen) that you’d expect from a higher end lipstick. e.l.f.’s Moisturizing Lipstick in the shade ‘Ravishing Rose’ is probably the most universally flattering shade, in my opinion. You can see the slight glossiness and opaque coverage you get after about three swipes. As you can see, three ‘kisses’ later a lot of the lipstick has come off, leaving behind just a hint of color on the lips. Overall, there are definitely some pluses and minuses to these lipsticks. But considering their low price (~$3), I’d say they’re worth a try if you’re not bothered by the ingredients. Just be prepared to re-apply them quite often. The e.l.f. Studio Moisturizing lipsticks are available at drugstores (Target, CVS, Walgreens, Rite Aid, etc), and on e.l.f.’s website and Amazon. Have you tried the ELF Studio Moisturizing lipsticks? If so, what are your thoughts on their formula?